Joe Cornish has had very little time to give talks in the last couple of years. So you might like to know that he is doing a special one-off evening event in London at the Royal Geographical Society on Friday October 24th. Joe would be delighted to see you there. You can get tickets at the Wildscreen Photography Festival website. Joe will also be hosting the Natural History Museum's "Understanding Photography" event on Oct 23rd. 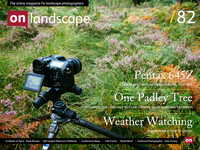 One of the other guest photographer/presenters will be On Landscape correspondent David Clapp. You can buy tickets at NHM website.